March 23, 2019 5:51 pm. 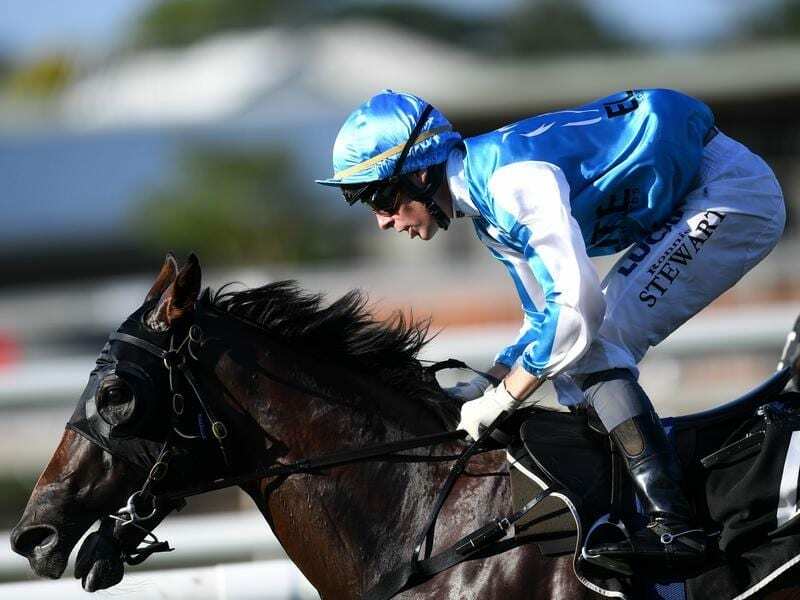 Straturbo has recorded what is believed to be the second fastest 800m run in a race in Australia. Veteran Straturbo showed times don’t lie when he scored an impressive win in the Brisbane Racing Carnival Open (1000m) at Eagle Farm. The race was delayed by 30 minutes when apprentice Clayton Gallagher was thrown from Hard Stride on the way to the barrier after the horse bucked. Gallagher was treated on the track for 15 minutes before being taken to hospital with lower back pain. Straturbo ($31) came away in the straight to beat From With ($4.60) by a length to bring up his 11th race win. Originally trained by Gary Portelli in Sydney, Straturbo won two stakes races and the Magic Millions Sprint as a younger horse. He was transferred to Brisbane’s Tony Gollan last year and won at Caloundra for the premier trainer. Gollan sent him to Dalby for the Lightning over 800m at his first run back from a spell and he won running 44.10, believed to be the second fastest 800m run in a race in Australia. Gollan was in Sydney but stable foreperson Holly Wiliams said Straturbo was a stable favourite. “He is the oldest horse in the stables but a real gentleman,” she said. Trainer Kelly Doughty has been saying for the past two years she could hardly wait for the return to racing at Eagle Farm for her mare Benfica Princess. Benfica Princess ($13) took her record to five starts at Eagle Farm for three wins when she stormed home late to beat Red Colours ($51) by a nose with a nose to Francisca ($4.80) in the Prostrate Cancer Australia Handicap (1500m). “I don’t know how many times we said over the past two years we wished her race had been at Eagle Farm,” Doughty said. Tony Sears has a big opinion of three year old Rock Beat ($18), who won the TAB Three Year Old (1000m) in slick time. Rock Beat ran a class record of 56.79 when he beat the heavily backed Pizonie ($4.40) by half a length. “I think he has a real future. It is great because he is raced and bred by some of my biggest supporters in the Harvey family,” Sears said.